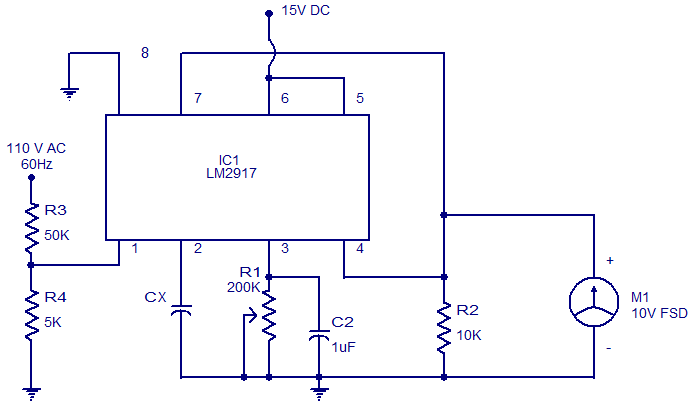 The circuit diagram of a simple capacitance meter using IC LM2917 is shown here. The LM2917 is a high gain monolithic frequency to voltage converter IC from National Semiconductors. Even though the main application of LM2917 is in tachometers, it can be also used for a variety of applications like this. Capacitance values from 0.01uF to 0.1uF can be measured using this circuit. The capacitance to be measured is connected between pin 2 of the IC and ground. The output voltage available across resistor R2 will be proportional to the Cx and it will be displayed by the meter. Resistor R1 can be used for calibrating the circuit. Resistor R1 can be used for calibration. Meter M1 should be a 10V FSD voltmeter. For M1 You can use a 1 m.a. meter and connect a 10K resistor in series with the meter, By Ohm’s Law E=I x R= 1 m,a. x 10K =10 volts. If you need a 5 volt Meter use a 5K resistor( 2 10K resistors in parallel ) All I did here was convert a ammeter into a D.C. Voltmeter. This is a possible solution to the 10V FSD PROBLEM. i WOULD STICK WITH A 555 Timer @ 60 Hz Rather than the A.C. VOLTAGE DIVIDER……..I couldn’t agree more with Steven’s concern on A.C, Voltage Issue,,,,,,,thE 555 Solution is a much safer alternative!!!! Why not try using a step down transformer around 8 to 12 vac??? Good Building and Stay Safe!!! This is a question to Steven. Can you publish a suitable circuit for a “practical” capacitance meter? I have the same question as Edgardo and Victor. I am worried by the indication in the schematic of a direct connection to the live mains. This is extremely dangerous when done by a novice circuit builder. Much safer is to derive the 60 Hz clocking reference from the lower voltage secondary winding of the power supply that is used to feed the 15 volts DC working voltage to the LM2917. Resistors R3/R4 form a 10:1 mains voltage divider so 8 to 12 volts AC could be applied directly to pin 1. An alternate application would be to use a LM555 as a cheap 60 Hz oscillator. The term FSD means simply “Full Scale Deflection” and is mostly meaningless in the modern era of digital readouts. As presented, this circuit is only of educational value and not a practical capacitance meter for the workshop. I also have the same question raised by Edgardo. In addition, what is that indication of 15V DC connected with pin 5&6 of the IC? Can you give an idea to use it for higher value capacitors? Do you have simple circuits similar to this to measure inductance? In this circuit, what do you mean by thE 10V FSD?, I mean FSD only. How can I coonect this to 220V AC supply?